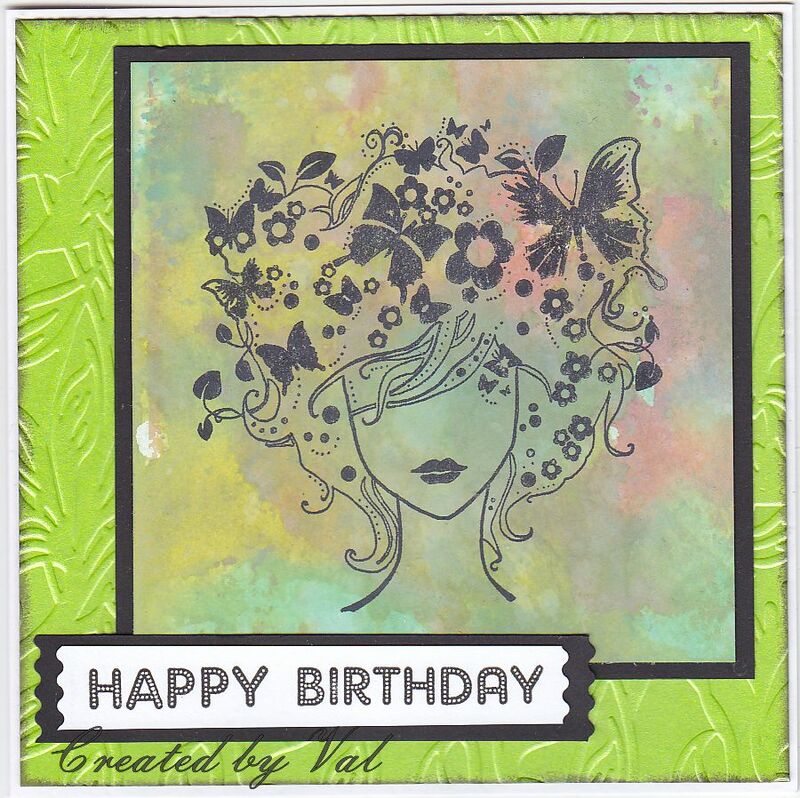 You might need dark glasses to view this card made for the current Butterfly challenge where the theme is Jagged Edges and/or Kiwi Colour. I think I've covered both options although the jagged edges (on the sentiment) are only small. I started with a piece of card which had been treated to some Distress Oxide inks and on this I stamped an image using Archival ink, layering this piece onto black card. The base layer is Centura Pearl card in 'kiwi' green and was embossed to give it some detail. Finally a sentiment was stamped and layered onto a strip of black with both ends cut using an old pair of fancy scissors - remember those from way back??? 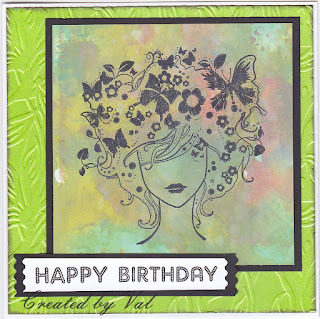 Once the inky background was made this was a fairly quick card to put together but you have to admit it is a bit GREEN. The butterfly stamp is one which I've had for several years and I'm pretty sure it may only have been stamped once before, if at all but it is the sort of image which seems to work well on these inked backgrounds. This looks super. Must admit your jagged edge is not one I thought of but it fits the bill perfectly. Love that stamp and do wish peeps would stop using those oxides. I'm on a no spend regime and can't wait to get my mitts on them. Thank you for fluttering by the butterfly garden. Hugs Mrs A. A beautiful card .. .. love your image and background very much. I used to have quite a few of those fancy edge scissors when I first started cardmaking .. .. I only parted with them recently during a crafty clearout and send them to a local school for the kids to use. I do still like using my very old pinking shears on my cards though. Wow, I love the colour you went with for this challenge Val, so in your face, but great as well. I love the stamp you've used too.